The first spacewalk in the history of space exploration lasted 12-minutes 9-seconds, and it was hailed as yet another great success for the USSR in the space race against the United States. It was only after the fall of the Soviet Union in 1991 that the west found out that while it may well have been made to look like a success by the Soviet Press, it was, in fact, it was teetering on the edge of disaster from the moment Leonov stepped out of the airlock till the crew were rescued from the vast frozen forests of northern Russia. The real footage of the Voskhod 2 mission and the first spacewalk in the history of space exploration. Voskhod 2 (English: “Sunrise-2”) was a Soviet manned space mission in March 1965. The Vostok-based Voskhod 3KD spacecraft with two crew members on board, Pavel Belyayev, and Alexey Leonov, was equipped with an inflatable airlock. Liftoff took place at 11:00 AM on the morning of 18 March. 90 minutes into the mission at the end of the first orbit, Leonov began his spacewalk, 475 km (295 mi) above Earth, while the other cosmonaut of the two-man crew, Pavel Belyayev, remained inside. But things didn’t go as they were expected. As he pushed himself away from the spacecraft, he immediately entered a spin, jolting to a stop at the end of his 5-meter (17 feet) tether. Leonov’s only tasks were to attach a camera to the end of the airlock to record his spacewalk and to photograph the spacecraft. He managed to attach the camera without any problem. However, after a few minutes into the spacewalk, when he tried to use the still camera on his chest, Leonov noticed that his spacesuit was unexpectedly ballooning in the vacuum of space. He was unable to reach down to the shutter switch on his leg. Making things worse, his hands and feet were slipping out of the boots and gloves, his suit had stiffened, due to ballooning out and he realized that it might soon become impossible to re-enter the narrow airlock. He had only about five minutes of daylight left before the spacecraft will be on the night side and it will be totally dark. Without referring to ground control, he made the decision to slowly vent air from his spacesuit in order to be able to bend the joints, eventually going below safety limits, until there was less than half the pressure remaining. But he was under the risk of suffering from decompression sickness now. At this point, realizing that the mission was experiencing difficulties, Soviet state radio and television had stopped their live broadcasts from the spacecraft. The low pressure worked and the suit regained its correct size. Leonov finally pulled himself into the airlock headfirst when he should have gone in feet first, causing him to struggle as he tried to turn around in the narrow airlock. This extra struggling caused his body temperature to soar, approaching the danger zone for heatstroke. Eventually, Leonov made it back into the capsule. But the danger was far from over. After Belyayev jettisoned the airlock, he discovered that the hatch wouldn’t seal properly and worse, Voskhod’s automatic climate control system was trying to compensate by increasing the oxygen pressure in the capsule. In this super-oxygenated environment, any spark could ignite an unstoppable fire, the very scenario which had killed Valentin Bondarenko four years earlier as he was in training to become a cosmonaut, and what would go on to kill the crew of Apollo 1 in 1967. The two cosmonauts worked to lower the oxygen pressure, also the temperature and humidity. They finally managed to lower the oxygen pressure under safety limits. But it wasn’t the end of problems for the mission. Voskhod spacecraft was fitted with an automated re-entry system, but it failed. On the next orbit, the crew had to make a manual re-entry burn instead, something no one had done before. The spacecraft was so cramped that the two cosmonauts, both wearing spacesuits, could not return to their seats to restore the ship’s center of mass for 46 seconds after orienting the ship for re-entry. During the manual re-entry, the orbital module did not properly disconnect from the landing module, causing the spherical return vehicle to spin wildly until finally, the connecting straps burned up the heat of re-entry and the modules disconnected at 100 km. Now the crew had little control of where they would land. They made the decision to try and land in the Taiga, a vast and almost completely uninhabited forest in the far north of Russia. The 46-seconds delay changed their trajectory and pushed the craft 386 kilometers from its intended landing point. The spacecraft finally landed at 9:02 GMT on March 19th in the thick snowy forests of the Ural mountains. No one at ground control actually knew where the spacecraft has landed. The two cosmonauts had to spend the night in the woods in minus 25 °C (-13 °F), as they waited for their emergency radio transmissions to be picked up and their position located. But the area was so heavily forested that the rescue helicopter had to land 9 kilometers (5.6 mi) away and the rescuers had to ski to the landing point. Recent accounts report Cosmonaut Leonov violated procedure by entering the airlock head-first, then became stuck sideways when he turned to close the outer hatch, forcing him to flirt with decompression sickness (the “bends”) by lowering the suit pressure so he could bend to free himself. Recently, Leonov said that he had a suicide pill to swallow had he been unable to re-enter the Voskhod 2, and Belyayev been forced to abandon him in orbit. 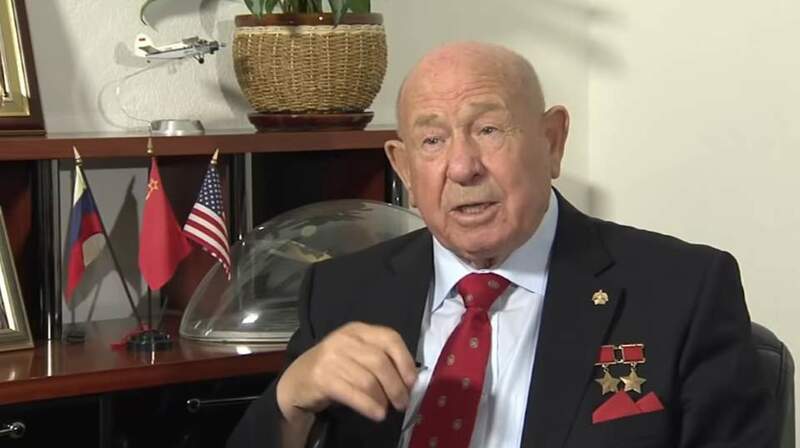 Alexey Leonov in 2015. He said that he had a suicide pill to swallow had he been unable to re-enter the Voskhod 2. Despite being hailed internationally for its success, the failures of the mission led to the cancellation of the Voskhod program. Leonov’s famous spacewalk effectively marked the end of the Soviet supremacy in space. A few months later, the head of the Soviet space program, Sergei Pavlovich Korolev died unexpectedly a few months later on January 14, 1966. But the Special Design Bureau 1 (OKB-1) pushed on to develop the Soyuz, a much more capable vehicle which was first operated in 1967 and still in use today. The Soyuz has proven itself to be the most reliable long-term ride into orbit to date. “The Spacewalker” tells the story of the first spacewalk in the history of the space exploration. The 2017 movie successfully tells the story above, the story of humanity’s first-ever spacewalk. Two men in a tiny spaceship, without proper testing, facing the complete unknown. The story keeps turning around all the time and will keep you watching till the last frame. There is a great emphasis on human values and willpower. And great CGI will also keep your eyes filled with plenty of awesome views. Some historical footage also included into the film. 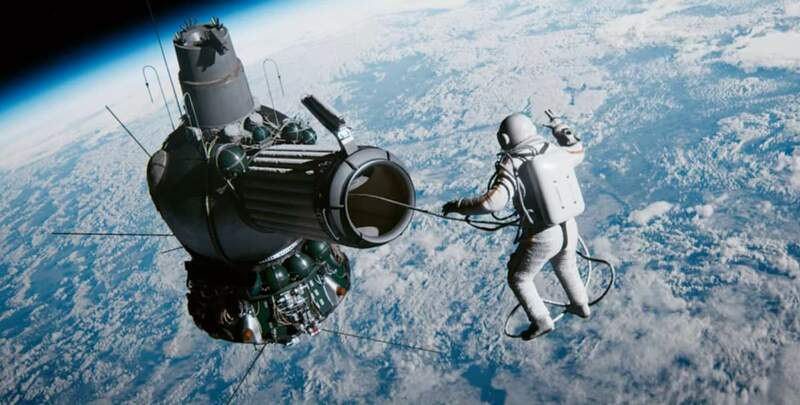 The film also shows the high political pressure on the Soviet space program which had to maintain early successes, like putting the first man into outer space (Yuri Gagarin) and six Vostok manned missions between 1961 and 1963. In the United States, the Gemini mission was aiming to fly multi-crew missions and astronaut Ed White was in training to make the first spacewalk or “Extravehicular activity (EVA)”, any activity done by an astronaut or cosmonaut outside a spacecraft beyond the Earth’s appreciable atmosphere (Ed White has executed the first U.S. spacewalk a few months later, on June 3, 1965). In order to be the first, the Soviets made risky moves. Adapting the Vostok single-seat design, the first Voskhod capsule squeezed three couches at 90-degrees angles to the central spacecraft controls. The spacecraft was so cramped that the crew had to adhere to a strict diet just to fit in their seats. Designers considered every way to save weight and space. For example, the ejection seat mechanism was removed, which meant that if anything went wrong in the first two and a half minutes after the launch, there was no way out. “The Spacewalker” trailer, with English subtitles. It is a reference to the popular but erroneous quote “Houston, we have a problem” from the radio communications between the Apollo 13 astronaut John (“Jack”) Swigert and the NASA Mission Control Center (“Houston”) during the Apollo 13 spaceflight, the seventh manned mission in the Apollo space program and the third intended to land on the Moon. Two days after the launch, an oxygen tank exploded and crippled the spacecraft. As the astronauts communicated their discovery of the explosion with the ground control, the words actually spoken, initially by Jack Swigert, were “Okay, Houston, we’ve had a problem here“. After being prompted to repeat the transmission by CAPCOM Jack R. Lousma, Mission Commander Jim Lovell responded, “Uh, Houston, we’ve had a problem.” The erroneous wording “Houston, we have a problem” was popularized by the 1995 film Apollo 13, a dramatization of the Apollo 13 mission, in which actor Tom Hanks, portraying Lovell, uses that wording, which became one of the film’s clichéd taglines. Since then, the phrase has become popular, being used to account, informally, the emergence of an unforeseen problem. Previous PostWhy it’s only science that can answer all the big questionsNext PostHow Can Technology Help Minimize The Damage From Natural Disasters?